What’s going on, Walmart? What kind of market research do you have tucked away? First you activate the nostalgia centers in the brains of ’90s kids with Slime Sauce ketchup, and now you’re aiming for the “hey remember that one trip we took to Cedar Point after graduation, that was fun” demographic. Are we that easily seduced? 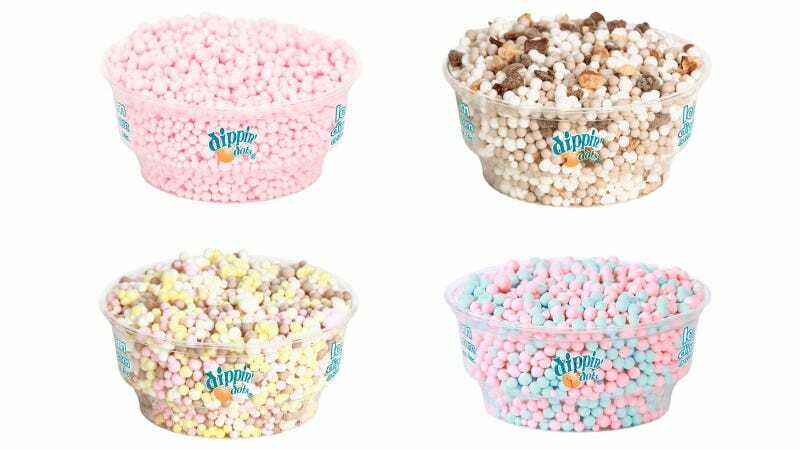 There are four components to this cereal: three balls of sweetened corn and oat cereal resembling Dippin’ Dots in strawberry, chocolate and vanilla flavors, and a bumpy little ball called a “Banana Split Flavored Cluster.” I took out four pieces and tasted each individually. Each of the balls actually resembles its respective flavor really well. Strawberry tastes like legit strawberry, chocolate like chocolate, and vanilla like vanilla. They aren’t too overpowering, which I’m anticipating will be a good thing, because of the Clusters. Ahhh, the Clusters. I think I’m in love with these Clusters. They are pastel and pretty, and have a soft coating. When I bit into one, it had the texture of a Rice Krispies treat, which was pretty fun. Now the flavor… Unbelievably yummy. I could eat a box of just the Clusters. You can pick up this weird but oddly appealing breakfast item at Walmart, where a box will set you back $3.64. Strangely, you can also buy a single box for twenty freaking dollars on Amazon.